PRODUCT DESCRIPTION: Duster and Aerosol applicator which is able to reach over 25 feet up the sides of structures. The unit is over 21 feet long when fully assembled which means the average person is able to reach over 25 feet up. Extra extension poles are available for even higher reach (ITEM 282261: 4 FT EXTENSION). The DUSTICK comes with a pump handle which is used to blow dust out, 4 tube sections each of which are over 4 feet long each which fit together, the Dust Canister Top, the Aerosol Top and a carry bag. When used to apply products like DRIONE or DELTAMETHRIN DUST, the "bicycle pump" handle is used to force air through the extensions which blows dust out the dust tank on top. The Dustick Deluxe also includes the Aerosol Top which fits most any kind of Aerosol Spray like PT-515 WASP FREEZE, PT-PHANTOM or DFORCE. Using the included "pull string" on the Aerosol Top, you can manually operate the aerosol from afar enabling you to reach high places in excess of 25 feet. The Dustick Deluxe also comes with a Scraper Top which can be used to scrape down old wasp and bee nests. This Deluxe Kit includes all of the following: DUSTICK (ITEM 282258), AEROSOL TOP (ITEM 282267) and the SCRAPER TOP (ITEM 282270). I am sorry but at this time our international shopping cart can't handle calculating freight for this item since the Dustick can't ship using our preferred shipper. You see, our shopping cart uses International Mail rates which are the least costly and most reliable. However, the one limit with this service is that we cannot ship boxes which are longer than 46". Since the Dustick ships in a box that is just over 49", using International Mail is not an option for this item. However, we are able to ship this item via FedEx or UPS service. So if you're interested in receiving a quote, please submit your ship to address, along with the sku of the item model you'd like to order, and we'll respond promptly. How do you get the dust into the tank??? The top of the dust canister unscrews and you fill it through the opening. It's plenty big and the top comes off and goes on easily. I broke the tip that fits under siding, the one that comes with the dust stick. Do you sell a replacement? Thanks. Worth every penny!!! Thank you! Smart money spent on this purchase! 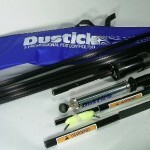 The Dustick Deluxe Kit is incredibly simple to use. Having done my two houses already I am sure it has already paid for itself compared to the cost of a "professional" coming out to my house. I bought it to defeat my reoccurring carpenter bees once and for all, so, as per this sites recommendations, I bought one pound of Drione. Both are great products and are designed for professional use. My advice though is to take this use of the Dustick seriously, read the directions until you understand them – especially the part about keeping the Dustick VERTICAL – never horizontal. And, same goes for use of the insecticide Drione – wear a mask and sealed eye protection – even a pair if swimmers goggles because you do NOT want to get Drione in your eyes or lungs because of the silicate. Wash up afterwards before touching your face or children etc. Am glad I paid extra for the deluxe kit since it has a very well made carrying bag. But I now also use the shipping box for storing it as well.